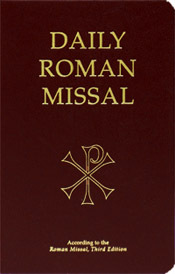 This new Seventh Edition includes liturgical texts from the Third Edition of the Order of Ordinary Form of the Mass; all prayers, antiphons, and other texts for the seasons of the liturgical year; the Proper and Commons of Saints; Masses for the Dead; and many Ritual, Votive, and other Masses. It includes all readings (New American Bible with Revised New Testament) from Sunday and weekday Masses, the Proper and Commons of Saints; and many from the Ritual, Votive, Various Needs, and Masses for the Dead. All this plus over 200 pages of devotions and prayers complete this dignified, one-volume hand missal.